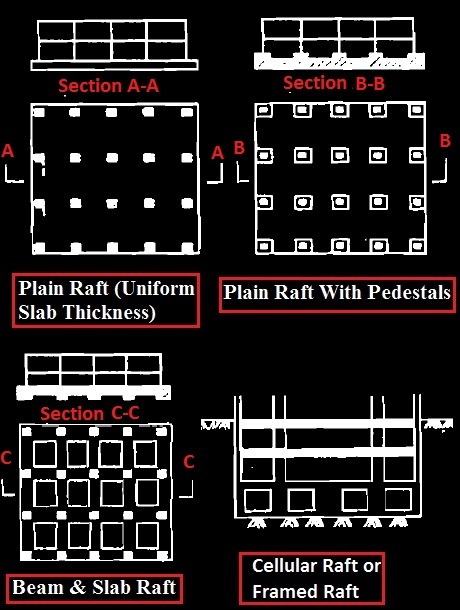 Raft slab of uniform thickness is very popular as it is simple in design & construction. When column load is very heavy, sometimes pedestals are introduced to transmit load to bigger area. This type of raft is selected when column spacing is uniform and fairly small and moderate loading are imposed on columns. Raft with slab and beam are chosen, when they have to support heavy buildings. This is usually required to reduce excessive distortion of supported super-structure due to expected variation in compressibility of soil underneath and variation of load on raft. This type of raft has obviously many difficulties. If the beams provided are deep, the ribs produce problems with placement; if ribs are projected above raft slab, the basement becomes useless and whether an upper slab above inverted beams is provided to form a ground floor or the gaps between ribs are filled up. In this case, the entire foundation has to be lowered. When ribs are placed below raft slab; the construction of beams need excavation and after casting the gap remains around beams have to be filled which produce disturbance in soil mass and obviously impair bearing capacity of foundation soil. Water proofing in this case becomes very complicated. 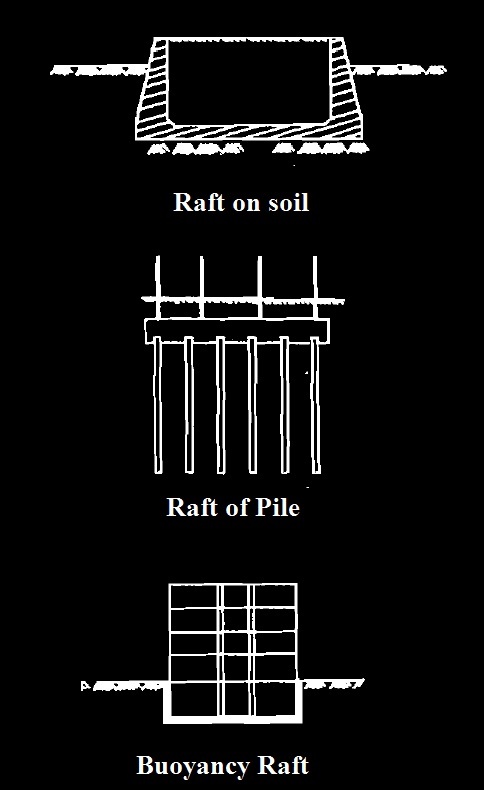 Buoyancy raft is also called compensated foundation where weight of soil replaced by basement balances full or large extent of super-structural loading. Cellular raft discussed above can be designed but considering performance, it produces significant uncertainties and construction difficulty is also worth mentioning. The usual practice is to support raft solely on soil. But sometimes piles in addition to raft have to be introduced to reduce settlement of foundation. Let take an example of large building supported on deep clay deposit and raft or mat foundation is found sufficient to ensure adequate safety factor in respect of failure due to ultimate bearing capacity but not sufficient to limit excessive foundation settlement and piles are required to reduce settlement. But it is not wise to design piles on the basis of ultimate load considering piles solely taken all load from superstructure. We have to calculate number of piles required to reduce excessive settlement for a particular type, diameter of pile and ambient soil condition.